Situated in beautiful waters, this lovely five star resort in the Maldives, located in the Indian Ocean, sits on its own idyllic island. 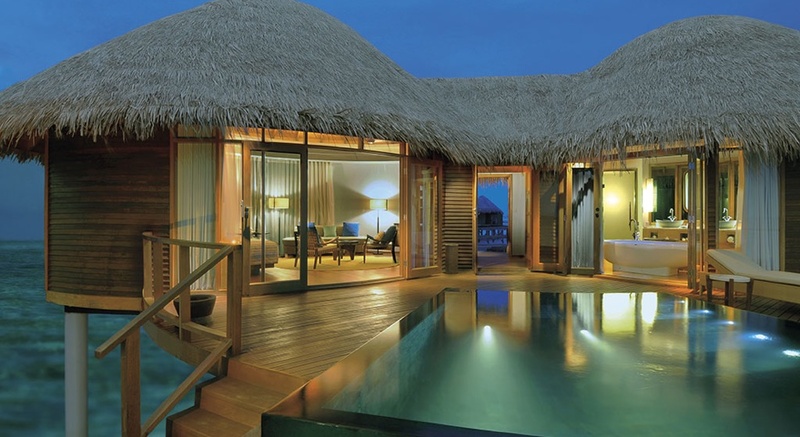 The Constance Halaveli Resort Maldives is a peaceful experience offering stunning views and a one of a kind experience. The Constance Halaveli Resort offers land and water based accommodations all with air conditioning, hairdryer, 42″ LCD TV/Satellite channels, DVD, free WiFi internet access, ipod connections, telephone, desk, minibar and mini wine cdooler, tea and coffee facilities, individual safes – and last but not least, outdoor showers. The resort offers pedal boats, windsurfing, and kayaking equipment free of charge. Diving with PADI certification can also be arranged. Water skiing, kneeboarding, wake boarding, and banana boat rides are just a few of the fun things available. The Spa de Constance is a luxurious and tranquil experience. Enjoy the gentle lapping of the ocean as you treat yourself to relax, rejuvenate, and enjoy. Children of any age are permitted at the Constance Halaveli Resort in the Maldives, at any time of the year. Contact Remarkable Honeymoons for the Constance Halaveli’s current rates and specials!